*Shown with add-on Star of David charm." 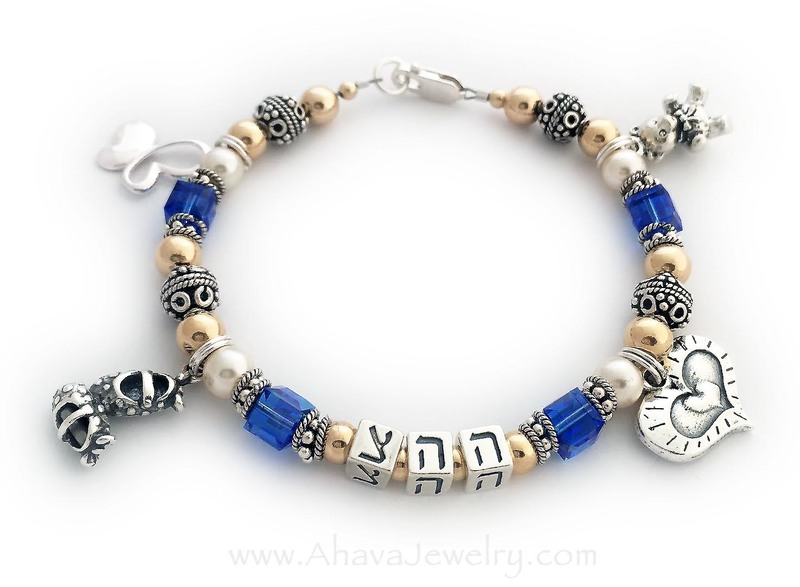 Bubbe is Yiddish for grandma and on this Gold Bubbe bracelet I used the Hebrew letters for Bubbe (Bubby or Bubbie). The Hebrew letters going from left to right it are Bet, Vuv, Bet, Ayin. 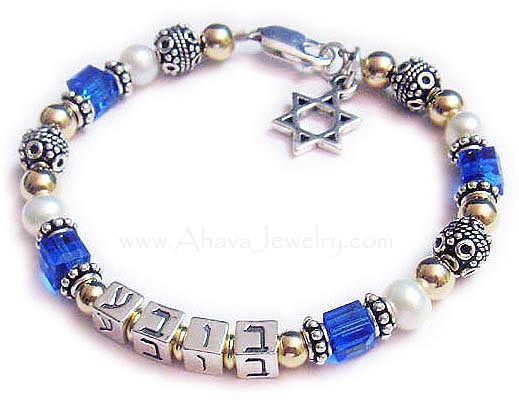 This Gold Bubbe Bracelet is shown with a Star of David charm which is additional. You may add a Star of David charm or one of our other 100 charm options during the ordering process below. The bracelet shown is a 7 1/2" and is considered "average" in size. You get to choose the colors of the crystals. It is designed with blue (September crystals). You can have all one color or up to 6 different crystals per string. You may have up to 5 strings and have a different child or grandchild's name on each string with their coordinating birthstone crystals. You may enter the name in Hebrew or English. If you would like me to translate it into Hebrew for you, please type HEBREW after the name(s). I will send you a picture before I ship it to you to be sure everything is perfect! Butterfly charm, Baby Girl Bootie Charm, Heart within a Heart Charm and Teddy Bear Charm. You can have up to 5 strings and up to 20 names on a 5 string bracelet! A 4 string bracelet with 4 names in English is shown below. This is a fully beaded necklace. The coordinating necklace looks just like the bracelet on an 18" chain with a lobster claw clasp. You will have approximately 7" of beads then sterling silver chain up to the clasp.